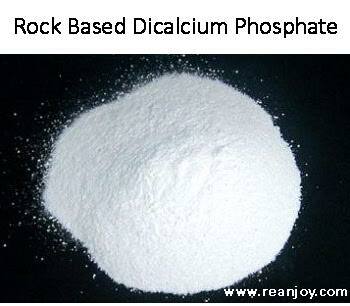 In Rock based Dicalcium Phosphate manufacturing process industry use many type of raw material in which some are proper quality (rock phosphate, sulphuric acid) and some not at proper remark, these mainly bones or only by product of many inorganic or organic reactions. When we not use proper raw materials then product not up to mark including many impurities like inorganic(chloride, arsenic, lead, tin), organic compound and show instability in high temperature and producing many impurities when mix with other inorganic compounds in form of mineral mixture and generate heat (it cause of decomposition of mineral mixture). Especially in India, many services work in the cattle and poultry farming segment. Many households also own livestock. Whether you are a businessman or a respectable citizen of India, Get in touch with the Reajoy Laboratories manufacturer & supplier of Rock based Dicalcium Phosphate animal feed grade. This ionic salt is a perfect nutritional additive for calcium supply in measured amounts. Although many cattle owners prefer tricalcium phosphate is for its high Calcium content, yet too much of the strength-element may only be suitable for very feeble animals. Consult a professional veterinary doctor to determine the dosage that you need to provide per gm of food. The chemical representation of this salt is CaHPO4. The hydrogen phosphate is negatively ionic and it replaces body phosphate. The measured combo of positive Calcium and negative Phosphate strengthens bones at the core and even works to improve the genetic structure of unhealthy cells. In fact, apart from adding it to fodder, you can also use the salt as a caking agent. In its dry shape, it forms a hydro complex with water and safely removes it from foods, thereby keeping them fresh for an extended time. Calcium performs several crucial metabolic benefits such as improving muscle flexibility and a better transmission of neural signals. Raw material used – Rock phosphate, Sulphuric acid, hydrated lime above 92% purity, etc.